Ask fellow campers about "Lake Greenwood Motorcoach Resort " and nearby attractions. Grounds were wonderful. Most sites have a view of the lake as the sites are tiered. Roads are wide. Site #79 was spacious. It an an outdoor kitchen with a fireplace and BBQ. Pool and clubhouse are very nice. Not a ton to do in the area outside the park but if you are looking to kick back and relax, this is the place to be. We would definitely return to this park. We camped at Lake Greenwood Motorcoach Resort in a Motorhome. Agree with the previous post, this is a beautiful and relaxing park with all of the amenities. Also Break on the Lake, a new waterfront restaurant opened in the area. We camped at Lake Greenwood Motorcoach Resort in a Motorhome. Highly Recommended! This an ownership park with 85 very large sites. They are concrete or pavers with patios most with seating, some with outdoor kitchens and all are nicely landscaped. The lake view lots are beyond words and the sunsets are breathtaking. The management is incredibly nice and accommodating. We met a handful of owners and they were all friendly. The club house is fully loaded with pool, spa, outdoor kitchen, fireplace and laundry are clean. There are 2 separate dog areas with bags provided, one that is quite large but neither are fenced. There is a boat launch and dock so you can bring your boat or rent one. The WiFi works for everyday email and basic surfing. We liked this park so much we are returning for a month in early fall. 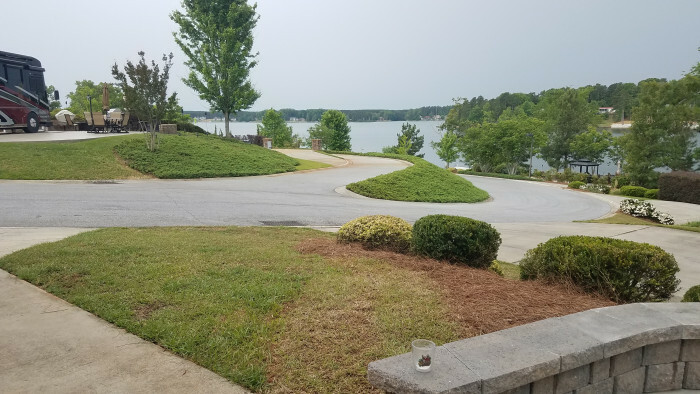 They price their sites at 3 levels - lake front, lake view and the last (and least) are sites that still have a lovely view but sit back from the water. The price noted is based on a weeks stay in a lake view lot. Although somewhat remote, there are 2 restaurants in Cross Hill (5 min drive) but Greenwood is 20 minutes away and has everything you could need. 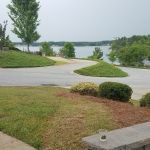 We camped at Lake Greenwood Motorcoach Resort in a Motorhome. Fat Daddy's BBQ & Hash is open Friday & Saturdays. Highly Recommend! Beautiful park for Class A motorcoaches only. About 4 miles out from a little town called Cross Hill. A large city, Greenwood, is about 26 miles away. The park is terraced with many of the lots overlooking the lake. One can buy a lot here. There is a host during the summer. The office is not attended so call ahead. They call back within an hour or so. Signage to the park is good but not a place to come to after dark. Long, wide cement pads that one can pull into or back into. Only 50 amp electric. The clubhouse is gorgeous with a full kitchen for residents' use. There is a heated pool and spa. An excellent place to come and relax a few days. We camped at Lake Greenwood Motorcoach Resort in a Motorhome. Lady Amelia's in Cross Hill is a B&B with a separate restaurant that serves lunch and dinner but not every day. Check out their website or call for times. The food is excellent as is the wine list. There is a post office and hardware store in "town". A BI-LO grocery is available southbound on Hwy 72 about 7 miles away as is a petrol station. Very nicely landscaped and clean resort. Out in the middle of nowhere with nothing to do. Shopping for food, etc. is quite a distance. Very quiet until the middle of the night when you are woke up to the sound of a train whistle. Nicely paved lots which are a little short for a big rig. You need to park your car sideways. There are no campground activities unless you are interested in boating and definitely nothing for children to do with no playground, etc. There is a pool, however. WiFi is good. We camped at Lake Greenwood Motorcoach Resort in a Motorhome. This is a beautiful Class A Only resort and the terraced lots give you plenty of privacy. We chose a site in the cheap seats and still had a spectacular view of Lake Greenwood. Many of the lots are privately owned, and from the nice upgrades, I'm guessing they are not available for rent. The clubhouse is really nice and the restrooms are spotless. Surprised that a park this size would only have a laundry with 2 washers & dryers, but many RV's these days are equipped with their own. If you want a nice restful place to stay, this is it. The only downside is that it is rather remote, and trains pass at various hours fairly close by. But we still found this to be a really nice park. We camped at Lake Greenwood Motorcoach Resort in a Motorhome. 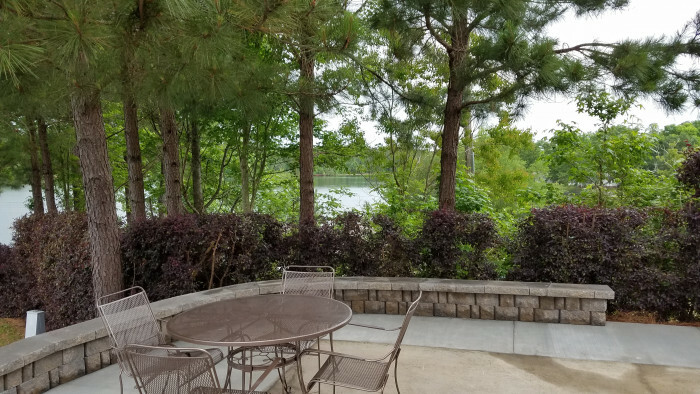 This is a beautiful small Class A-only resort located on Lake Greenwood. The streets are very wide and easy to maneuver although somewhat hilly. The landscaped and manicured sites are terraced to offer views of the lake with concrete pads. The staff escorted us to our site, guided us into the site, and was very helpful in every way. The resort is located in a very rural area so it's a few miles to groceries and other facilities, but that makes it very quiet except for the occasional train. We will definitely consider stopping here again. We camped at Lake Greenwood Motorcoach Resort in a Motorhome. The small town of Ninety-Six, SC has a very interesting history dating from the Revolutionary period. There is a National Historic Site in the town that explains the history. This is truly a "resort", unlike many Rv parks that claim to be. The sites are beautifully landscaped and maintained, and it's laid out for maximum views from each site. It is an owner resort. You can purchase a lot stating at $49k or you can rent. The resort is on Lake Greenwood, which is a huge lake with over 220 miles of shoreline. A pontoon boat would be nice to have if you owned a lot. The pool and hot tub were wonderful. The clubhouse is beautiful with a covered area overlooking the pool. Everything is immaculate and well maintained. No expense was spared in designing this resort. The owner/manager was friendly and helpful and the other lot owners were very nice, even taking us for a ride in their boat. It's a motor coach only resort. Class A's only. We camped at Lake Greenwood Motorcoach Resort in a Motorhome. Short and sweet. After staying 5 nights (2 in non-lakefront), we booked to come back for a month in July. Beautiful manicured grounds and friendly helpful owner/manager. Ownership campground, but available for short term rentals for transients. We camped at Lake Greenwood Motorcoach Resort in a Motorhome. We received a free week promotion so we stopped in on our way to FL from WI. The site layout is great the way the lots are tiered and staggered really makes the sight lines off the lot towards the lake very nice. The owner is very friendly and while we there on a promotion, he did not put a hard sell on. The club house is very clean, and a nice touch that they do was to post from the local papers the activities that were happening in the area that week. 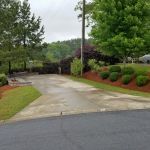 The area offers a lot: if you like boating, the campground has its own marina; there are some Revolutionary War sites in the area along with some nice golf courses. The people that already own were also very friendly, coming and introducing themselves and offering to take us out on their boats. With the discounts on the lots, I think he sold two during the week we were there. We enjoyed are week here! We will stop again when we are in the area. We camped at Lake Greenwood Motorcoach Resort in a Motorhome. We actually didn't pay anything for our stay. We received a coupon for a free week while at an RV show, so we decided to give Lake Greenwood a try. It's a beautiful campground, and if we were looking to buy a space we would consider this one. There was absolutely no sales pressure. The campground and owners speak for it themselves. The only drawback is that there is really nothing here to do. The largest town is around 20 miles away. Even with the historical small towns to visit, we would not choose this as a destination. It is very quiet and peaceful, except for a train that goes by periodically. If you are in the market to buy a campground spot, take a look at Lake Greenwood. We would return for a couple of nights if traveling through this part of South Carolina again. We camped at Lake Greenwood Motorcoach Resort in a Motorhome. This RV resort had changed its name to Lake Greenwood Motorcoach Resort. This will be a resort where all the sites are owned by individuals but many are put into a rental pool. If you purchase a site, it comes with a boat slip. Owners are very friendly and helpful. The resort is beautiful, peaceful and very quiet. Laundry facilities are clean, in good working order but limited (2 machines). Wi-Fi works best in or near the clubhouse. Wednesday night movies and Friday night wine/cheese social. The only drawback is it is about 30 minuets away from the highway or the nearest Wal-Mart. Don't know the rental rate as we stayed on an FMCA special offer. We will definitely go back, it should be beautiful when the leaves change in another couple of weeks. We camped at Lake Greenwood Motorcoach Resort in a Motorhome. This is a motorcoach only resort. It's back in the boonies on a narrow country road ending up at Lake Greenwood, a very nice lake. 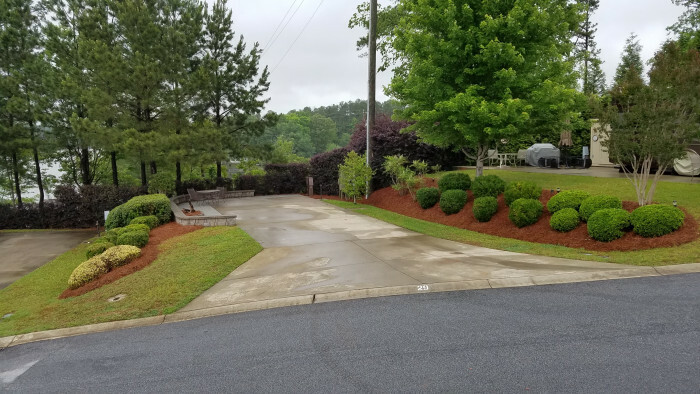 The landscaping is gorgeous, done by Park Seed Company. A VERY pretty rectangular pool, a fantastically decorated clubhouse, new laundry facilities but small. It's a VERY classy place. Unfortunately, it's in the middle of nowhere and quite a drive to get to shopping, about 20 miles. It's also a very hilly park all the sites are terraced, but have level, concrete pads. Almost every site has a beautiful view of the lake. The owners take you out on a pontoon ride once during your stay if you so desire. They were giving away FREE six nights' stay at the last RV show we went to, so we stayed for our free six nights and loved it. They are wanting you to come and see and stay long enough to get a feel for the park. No sales pressure at all. If it wasn't so far from shopping areas, we'd definitely think about a lot purchase. 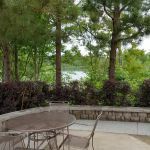 We camped at Lake Greenwood Motorcoach Resort in a Motorhome. We just returned from a week at this MH Resort. 1st. week is free. Purpose is to sell lots. We encountered no pressure to buy. Was told when we arrived, if interested in a lot, let them know and they would provide the info. Otherwise, enjoy our stay. Had a sunset cruise on the lake, wine and cheese reception, pancake breakfast, among other perks. Beautiful landscaping, very friendly management, outstanding facilities. We did not purchase but felt welcomed and they ask us to tell our friends to visit. We camped at Lake Greenwood Motorcoach Resort in a Motorhome. Very nice "Class A Motorcoach only" RV resort on beautiful Lake Greenwood. New name is "Lake Greenwood RV Resort". Large level concrete sites. Great Wi-Fi and friendly host. Plan to return soon. We camped at Lake Greenwood Motorcoach Resort in a Motorhome. 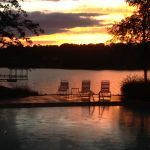 Are you affiliated with Lake Greenwood Motorcoach Resort ?